This tour is your chance to join Indian tradition, pilgrimage, and learn about its ancient culture and deities which have formed the India that we know today. Explore the sacred Varanasi. Visit Buddhist sites such as Sarnath, Bodhgaya and Rajgir. Continue to the north to Garhwal. Trek the Himalayas to Kedarnath and Badrinath. Journey to Rishikesh, the place the Beatles found inner peace in the sixties. Pilgrimage for Compassion North India is to truly inspire yourself through your own experiences that most people only dream about. The Salaam City Walk is a guided tour around the New Delhi Railway Station and Paharganj area in which former street children share their personal stories of survival with the participants and show them the contact points and shelter homes Salaam Baalak Trust provides. For the past three years it has been run by the Salaam Baalak Trust (SBT) – a non-profit organization, taking care of street and former street children living in Delhi. Through this program the young guides get an opportunity to improve their communication and marketing skills independently. The Walk aims to sensitize people to the lives of street children and helps to provide a deeper insight about street life from the people who have experienced it themselves. After lunch embark on a half day tour of Delhi. You tour to Old Delhi includes visiting the Jama Masjid Mosque and the Red Fort. Transfer to the airport to board your flight to Varanasi. You will be met at the airport and driven to Bodhgaya (approx.6-7 hours). Check into your hotel. Visit the Mahabodhi Temple and surrounding area. After breakfast we drive to the eternal city of Varanasi. Check into your hotel.Take an evening rickshaw ride to the Ghat to witness Aarti ceremony (blessing by lighting candles) on the Ganges. Early morning, take a boat ride on the Ganges River. After breakfast enjoy a city tour visiting Bharat Mata Temple. Durga Temple, Vishwanath Temple and the marble Shiva temple at Benaras University, Visit the colorful markets. See the kaleidoscope of colors radiating from the silk shops. Varanasi is famous for its handspun silk. After lunch, we take an excursion to Sarnath – the buried Buddhist city where Lord Buddha gave his first Sermon. 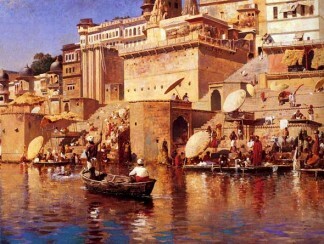 Return to Varanasi and enjoy your evening at leisure. Your early morning is free to explore as you wish. Transfer to the airport for your flight to Delhi where you will be met by our representative and driven onward to Haridwar. Explore this holy town. Join the Bajran and hear Dashan in the evening. Rudraprayag is one of the five confluences of the Alaknanda River, that joins with the Bhagirathi river to form the river sacred river Ganges. We drive from Guptkashi to Gaurikund to start the trek to Kedarnath (30kms by road & 14kms Trek). Gaurikund is located at an altitude of 6000 feet in the Garhwal Himalayas on the way to Kedarnath, one of the most sacred sites in Hinduism dedicated to Lord Shiva. Gauri Kund is connected with Shiva’s wife Parvati, also known as Gauri in various parts of India. In Hindu folklore, Gauri committed Herself to penance involving many ascetic and yogic practices to win over the affections of Shiva. Today we drive from Rudraprayag to Badrinath (165kms/7hr). Early morning we visit the temple. Later drive onward to Srinagar. Rishikesh is located in the foothills of the Himalayas and is referred to as The Gateway to the Himalayas. The sacred Ganges flows through Rishikesh and it is here that the river leaves the Shivalik mountains flows out into the plains of northern India. Several ancient as well as new templescan be found along the banks of the Ganges in Rishikesh. After breakfast we drive to Agra to visit the magnificent Taj Mahal and Amber Fort. We see the Taj Mahal and explore this amazing monument with its artistic paintings and inlay work in geometric and floral designs. Early evening drive back to Delhi. Transfer to the airport for your flight for homebound or a 4 Day Extension to visit Dharamsala, home to Dalai Lama.destination. – 15 nights accommodation as per hotels double sharing room. – Adequate mineral water during the sightseeing/long drives. – All transfers, sightseeing, excursion (non a/c transport hills)– Entrance fee to the monuments during sightseeing as per program. – Any meals except mentioned in cost includes. – Any items of personal nature like liquor, laundry, telephone —- Any other services/items not mentioned in program/quote include. Drive to Tilokpur and see Tilopa’s Cave, the Kagyupa Tibetan nunnery and rural village.